For the western group, it's all about the scenery. Deserts, mountains, more deserts and then, just for fun, more mountains. Most of the roads will be secondary and most will have route numbers. The eastern group is more about the small towns and the people. And history. Gettysburg, Wounded Knee, Dodge City are all on the way. The group meets at Uncle Bill's house for a barbeque on Saturday afternoon. Friends, family and neighbors are all invited to stop by and meet the riders. There will be plenty of meat, Boca burgers and liquid refreshments to satisfy just about everyone's palette. An early AM start has the group driving over to the Philadelphia Art Museum for a photo op at the top of the "Rocky" steps. Then it's off to Gettysburg, PA, Frederick, MD, Clarksburg, WV and finishing in Athens, OH. Once past Gettysburg they say goodbye to the Interstate. About 446 miles. Day 2 and the group spends it all on Highway 50. After leaving Athens they roll through Hillsboro, OH, North Vernon, Il Cincinnati, OH Vincennes IN to Carlyle IL. 431 miles. The Easterners start out in Carlyle and head through St Louis, MO. (scene of a nasty rain storm last year) Then it's more highway 50 through Rosebud, Sedalia (lunch at the Harley Dealer), Blue Springs and ends in Lawrence, Kansas. Dinner is with Uncle Bill's daughter and we continue the tradition of passing out kazoos and scaring the locals. It's about 358 miles for the day. Day 4 starts in Lawrence and ends in Dodge City. Photo ops along the way include Kaw Mission monument, Madonna of the Trails Monument and Fort Dodge. Another easy day at 340 miles.The best part of Day 4 is that we meet up at trail's end in Dodge City with our favorite sightseers from the Left Coast, the Western Long Reach Long Riders. The Eastern Group will probably arrive first, so we'll have to make it a down-home welcome for Grits' Gang, sure to be worn to a nub from all those canyons and lonesome pines. Day 5 is one of the longer ones, but it's definitely worth it. Dodge City to start and finish in Gordon, NE. Highway 2 out of Lexington is a designated scenic highway and the cameras will be working overtime. "Everything that rides must converge." Destination: Las Vegas. From points around California, but mostly San Diego, the Western Long Reach Long Riders (WLRLRs) meet at a quirky little place near Red Rocks, NV called the Bonnie Springs Motel. A throw-back to the 1950's, the motel features hardwood carpets, a petting zoo, horseback rides, and an Old West town complete with daily gunfights and hangin's. There will be a few iron horses parked outside tonight. That's just about 340 miles for the first day. The day begins with a leisurely ride through Red Rock Canyon National Conservation Area—a beautiful tumble of, well, red rocks. After exploring the 13 mile scenic drive, the WLRLRs drop down into Sin City for the requisite photo ops. Then it's up I-15 to St. George, Utah, where we hang a right at the Harley Davidson dealership and head up to Zion National Park. This is an easy day of just over 180 miles. No Iron Butts on this ride. We overnight near the park, perhaps at the Zion Park Lodge if Lady Luck smiles upon our motley crew. This will be a grueling day—all 350 miles of it. First it is a slow ride through the mile-long Zion tunnel and the spectacular eastern portion of the park. We pick up the pace and highway 89 north—yet another scenic highway (will it ever end!? )—and turn right on highway 12. After a short detour to Bryce Canyon National Park and lunch at the lodge, it's on to Escalante through the Grand Staircase—Escalante National Monument. It's slow going because of all the photo stops. Highway 24 appears on our right and takes us through Capitol Reef National Park—the 4th or 5th "national something" in three dang days! We meet I-70 near Green River and then dive down Highway 128 through Arches National Park (oh puhleez!) for an overnight in Moab. What the heck . . . ? Highway 191 isn't even listed as a scenic highway—it's just a road! It takes us to Highway 491 and Cortez, Colorado. Hmm . . . which way do we go? Durango or Montrose? We choose Montrose and ride along those gosh darn scenic highways again, all the way to Salida! That's 300 miles of unrelenting natural pulchritude. Ok, ok—enough of this indescribeable scenery—we gotta rest. So we do an overnight in Salida. Ok, we got a few more scenic miles to cover. 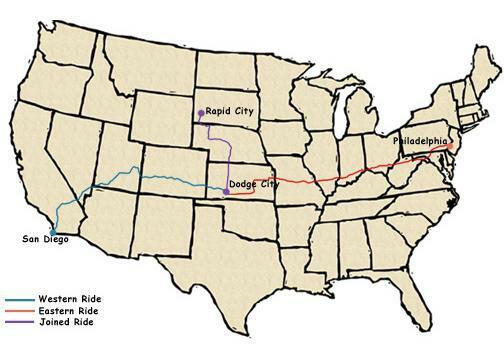 This time it's Salida, Colorado to Dodge City, Kansas. The first 100 miles or so are more of the same: 14,000 foot, pine covered peaks and verdant valleys (ho hum). But once we get to Pueblo, Colorado the real fun begins: 275 miles of Plain Jane. It feels like 2,775 miles. It's flat, it's straight—it's Kansas! But at the end of the day we get to meet the Eastern Long Reach Long Riders, and that makes the grind worthwhile. The two groups are together for their first full day of riding. Dodge City to start and finish in Gordon, NE. Highway 2 out of Lexington is a designated scenic highway and the cameras will be working overtime. It's local roads from Gordon, NE to South Dakota. We'll stop at the site of the Wounded Knee Massacre to pay our respects and then head over to Hot Springs and, hopefully, we'll stop at that little Mexican Restaurant that we found last year. We're hoping to be at Mt. Rushmore by around 2 PM. And then it's 4 nights in the Rapid City area. Fun, food, photos, and David learns to drive the really fast go-carts on the proper side of the track!